The state of Tennessee recognizes 15 legal grounds for divorce, including the no-fault grounds of irreconcilable differences and continuous separation between childless couples for at least two years. The process starts with one party, known as the plaintiff, serving a summons on the other spouse, known as the defendant. The road to a final settlement can be short or long, depending on the circumstances. 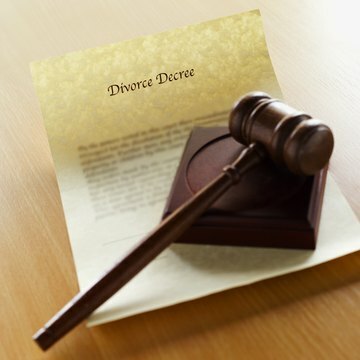 Since divorce can be complex, consult an experienced attorney before entering settlement negotiations on your own. A summons for divorce, also called a petition for divorce in Tennessee, serves as notification of the lawsuit. The petition includes a complaint for divorce, which cites the reason for the action. Unless the petitioner is asking the court to grant the divorce based on irreconcilable differences, the complaint alleges a wrongdoing or misconduct of the defendant. If this is the case, the petitioner must verify the summons by signing an affidavit, or making an oath or affirmation, before a judge, court clerk or notary public. For a court in Tennessee to have jurisdiction to grant a divorce, the summons must be filed in the county in which the defendant resides or in the county in which both parties lived in at the time of separation, if applicable. However, if the defendant is not a resident of Tennessee, or is incarcerated, the summons for divorce is filed in the county where the petitioner resides. Notification of the divorce action is not legally sufficient until the summons for divorce is properly served on the defendant. Usually, a process server or a sheriff’s deputy delivers a summons for divorce personally. If the defendant cannot be served personally, Tennessee laws permit service by publication or mail. If service is made by mail, the defendant is asked to sign a waiver of service of process to acknowledge receiving notice of the lawsuit. If refused, the petitioner can ask the court to attach the cost of a process server to the defendant. Once served with a summons for divorce, the defendant is required to answer the complaint. The “answer” is a written response filed with the court, which may also include a counter complaint against the plaintiff. As a matter of routine, the defendant typically denies the allegations made in the plaintiff’s complaint and makes a counter complaint to ask the court to grant similar relief as the plaintiff. If a summons for divorce in Tennessee includes fault-based grounds, such as marital misconduct, an automatic injunction is placed against both parties. The action is intended to deter either party from harassing the other or from initiating the premature sale, transfer or squandering of marital assets before the divorce proceeds to the financial discovery phase to reach a final settlement regarding property distribution, custody and child support.